(Los Angeles, CA) - It was a quiet day at the 2010 NHL Entry Draft for the Philadelphia Flyers, right up until the end of the first round. It was at that point that general manager Paul Holmgren announced that the Flyers traded the rights to defenseman Dan Hamhuis to Pittsburgh for the Penguins’ third round pick in the 2011 draft. Hamhuis was previously acquired along with a conditional pick from Nashville, for defenseman Ryan Parent six days ago. Holmgren said that he was not able to come to terms with the unrestricted free agent-to-be. “We couldn’t come to an agreement, to sum it up,” he said. Of course, the Flyers could still theoretically land the defenseman should the Penguins not be able to sign him, either. On July 1, Hamhuis would hit the open market. With the Flyers’ draft table situated in the back row close to the media risers, Holmgren’s every move was well documented by the attending media. One rumor going around is that Philadelphia is trying to acquire the rights to goaltender Evgeni Nabokov, who, like Hamhuis, is set to become an unrestricted free agent in a week. 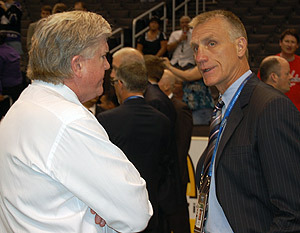 Holmgren was seen chatting with San Jose’s general manager, Doug Wilson, on occasion. He wouldn’t comment on anything that was said, however. “I’m not going to get into what I talked about with anyone,” he simply put. The Sharks have already announced that they will not re-sign Nabokov. Still, things were mostly quiet throughout the four-hour first round for Philadelphia. Holmgren asked around about possibly trading for a first round pick, but is clearly reluctant to tinker with the lineup of the defending Eastern Conference champions. “We made some inquiries but there are certain guys we’re not going to trade, obviously,” he said. “That’s the way it goes, sometimes. Those scouts will go to work tomorrow, as Flyers are set to make five choices when the draft resumes at the Staples Center at 1:00 p.m. beginning with a third round selection (89th overall). The draft will be shown on the NHL Network as well as stream live here on philadelphiaflyers.com.